Succulents are easy to maintain, easy to propagate, and best of all, they are unique and beautiful! There are lots of different kinds of succulents, but their care requirements are the same. 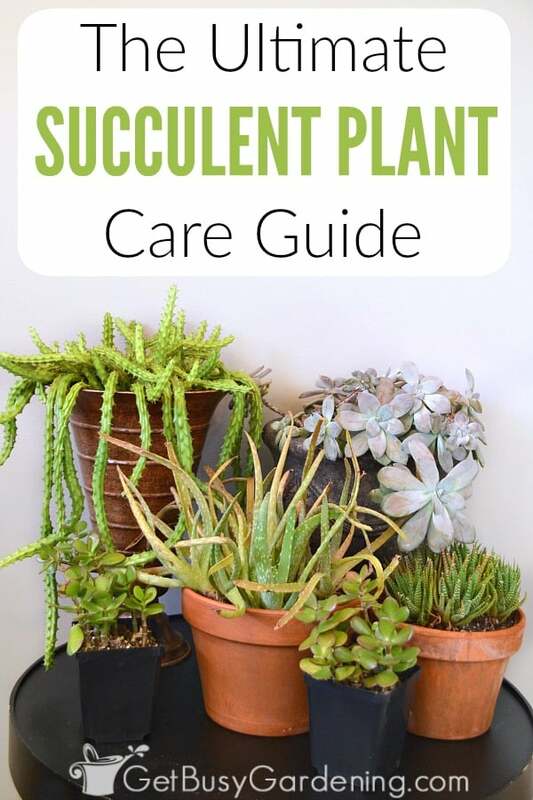 Learn everything you need to know about how to take care of succulents indoors in this in-depth succulent plant care guide. I have a large collection of indoor plants, and over the years I find myself with more and more succulents as houseplants. Succulents don’t mind it one bit if I ignore them for months at a time, which is perfect for someone who’s busy like me! I like to put my succulents outside during the summer, where they will thrive without any help from me. Then I bring my succulent plants inside during the winter, where they also require very little care. 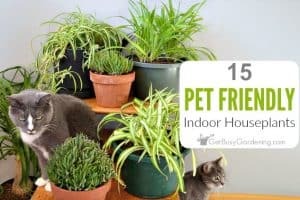 What makes them such awesome houseplants you ask? Well… succulent leaves, so they can go much longer between waterings than other types of houseplants. Plus, most succulents are more tolerant of being overwatered than cactus plants. And, maybe the best part about them is that, if you do overwater them, many succulent plants can be saved. That’s right, if a succulent plant starts to rot at the base, you can cut them off above the rot and propagate your succulents to save the plant. Growing succulent plants indoors can be tough if you’re not familiar with their needs. 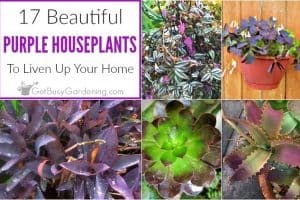 Like I already mentioned, they are easy to grow indoor plants, but some people find that caring for indoor succulent plants is much more difficult than other types of houseplants. Succulent plant care isn’t difficult, but it’s different than caring for your typical houseplant. Don’t worry, I’ve got you covered. I have many years of experience growing (ehem, and killing) succulent plants, so know what works and what doesn’t. Here are my succulent plant care tips. 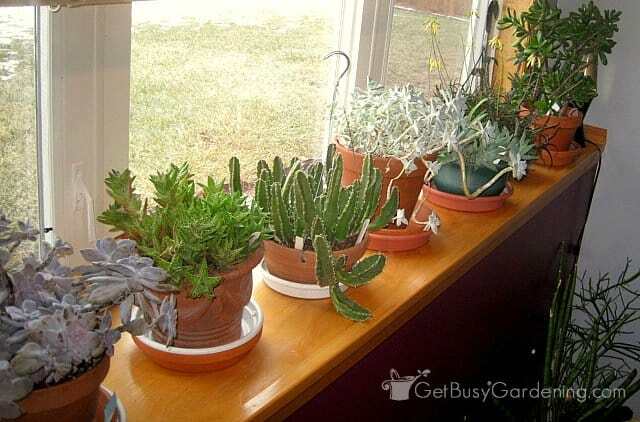 In general, most indoor succulents will grow best in a south facing window during the fall and winter, and then with filtered light during the hot summer months (if you don’t move them outside). On the other hand, if you’re growing a succulent plant in a sunny window and the leaves start to burn, then move it to a filtered light location. If you do end up moving your succulents outside during the summer, that’s great! Just make sure you don’t put them in a full sun location right away. Succulents grown indoors will need time to adapt to the sun again, so it’s best to move them to full sun slowly in the spring. Moving succulent plants directly from being indoors all winter to the full sun outdoors could burn the leaves, which can be fatal for small plants. When watering succulents indoors, it’s best to err on the side of under watering. 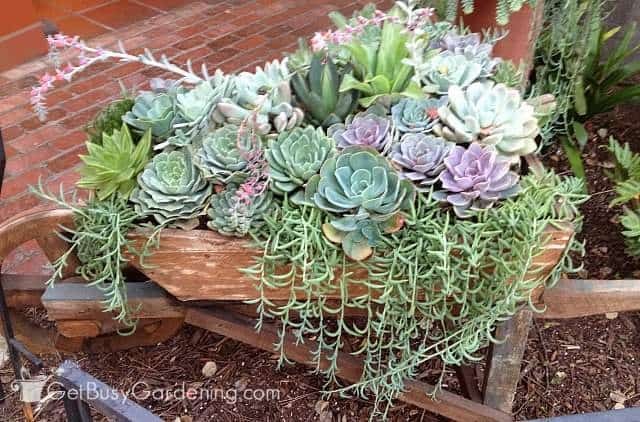 Consistently overwatering succulents in containers will cause them to rot and die, so it’s best to keep the soil on the dry side. 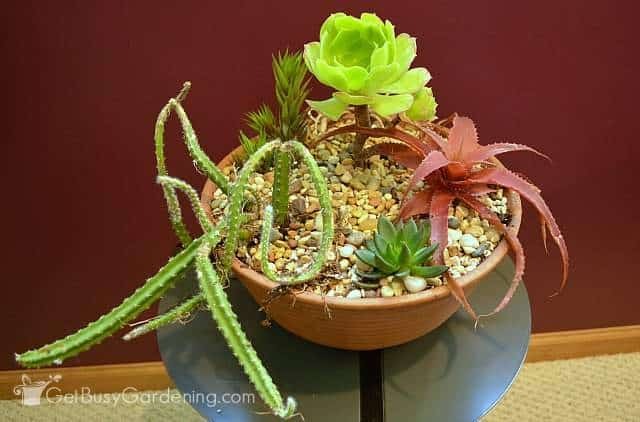 To water your succulents, pour water over the top of the soil until it starts to come out of the drainage holes in the bottom of the pot, and then wait until the soil is completely dry before watering again. As for how often to water succulents, they like to be watered more in the summer than in the winter. They will go into a dormant state during the winter, and therefore will require less water. So water indoor succulents very sparingly during the winter months, and a bit more often during the summer. If you are the type of person that tends to overwater plants, then I recommend growing them in a clay pot with drainage holes. Terracotta pots are good pots for succulents; the dry clay helps to wick the moisture out of the soil faster, which means that overwatering will be less of a risk. I also recommend getting yourself an inexpensive soil moisture gauge to make it super easy to know when to water succulent plants again. 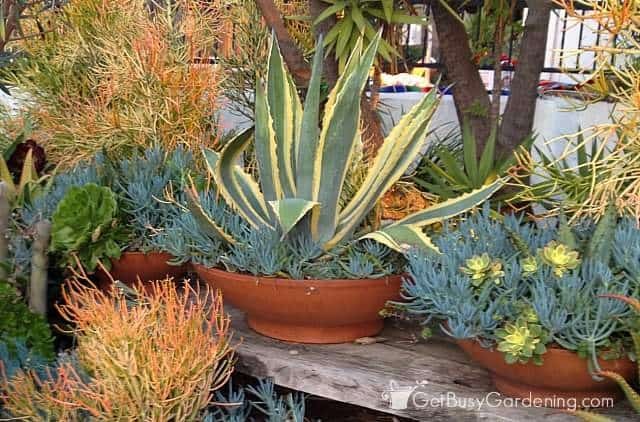 When it comes to growing succulent plants in pots, it’s super important to choose the right container. The best pots for succulents are ones that have drainage holes. Adequate drainage is a must for successful succulent plant care, especially if you plan to put your succulents outside. 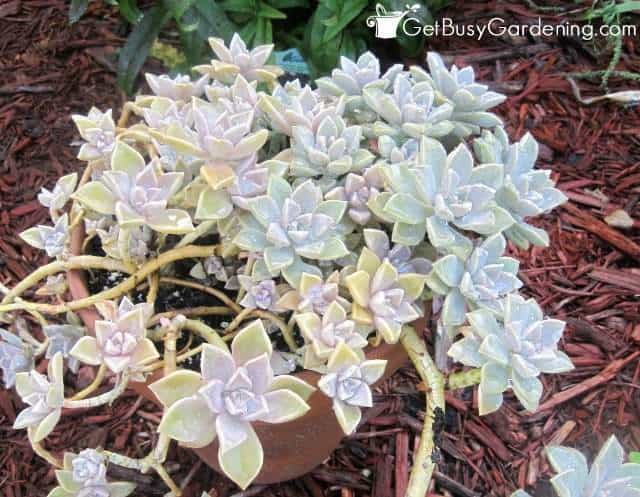 Succulents won’t tolerate soggy soil for very long, and choosing a pot that doesn’t have adequate drainage holes is a recipe for disaster. Don’t believe the myth about adding rocks or other fillers into the bottom of succulent plant pots to add drainage either, that absolutely does not work. In my opinion, the best planters for succulents (especially for beginners) are terracotta pots. 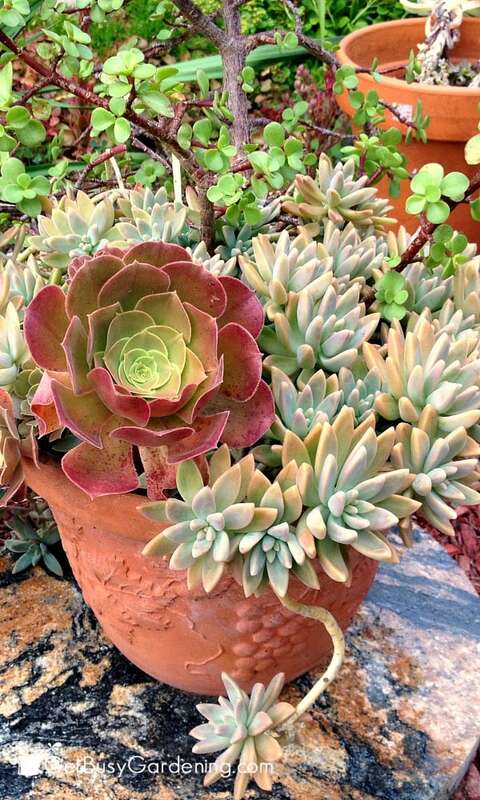 I grow most of my succulents in terracotta pots, which are not only beautiful, they are great for growing succulents! When it comes to indoor succulent plant care, one of the most common questions I get is regarding what type of soil to use for succulents. 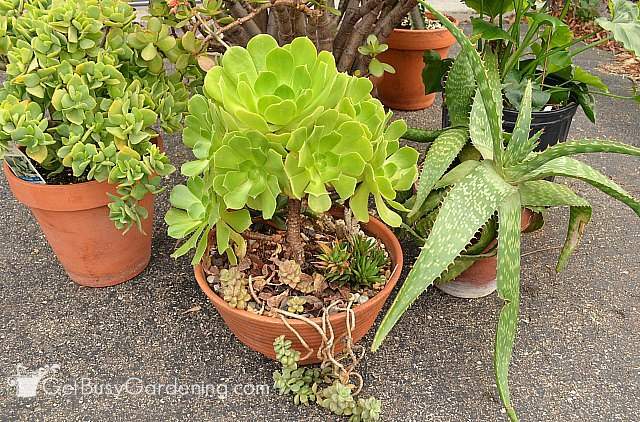 Since they don’t like wet feet, the best soil for succulents in pots is a fast draining, sandy succulent plant soil. You can buy commercial potting soil for succulents, or you buy a gritty succulent soil mix which will make it even easier to ensure you don’t overwater your succulents. 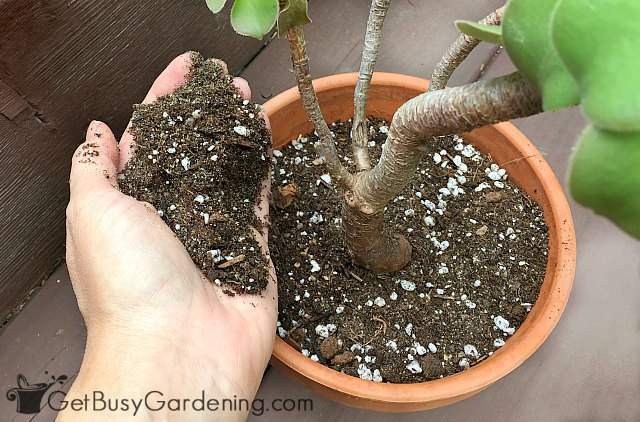 I like to make my own potting soil for succulent plants using a mix of perlite or pumice, coarse sand or poultry grit, and regular potting soil, which tends to be cheaper than buying the commercial stuff. Succulent plants in pots will benefit from being fed during their active growing period. To make this super easy, you can buy special succulent fertilizer that’s made specifically for feeding succulents and cactus plants. If you’d rather use something that’s more of a general purpose houseplant fertilizer so you can use it on your other plants too, I recommend getting an organic liquid fertilizer like general purpose indoor plant fertilizer, or compost fertilizer tea. You could also add a granular fertilizer to the soil if you prefer. Whatever you use, only fertilize succulents during the spring and summer months. 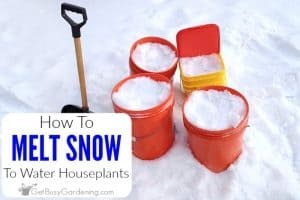 Start by giving them a weak dose of liquid fertilizer in early spring gradually increasing it to full strength, and then continue feeding them until fall. Don’t fertilize succulent plants during the fall and winter months. Succulent plants go into a state of dormancy during the winter, and the growth is usually very weak and leggy. So you really don’t want to encourage new growth during the winter. Healthy succulents don’t have many issues with plant pests, but sometimes aphids, mealy bugs or houseplant scale can become a problem. Be careful what you use to treat insect pest infestations on your succulents though. Some succulent plants can be very sensitive to insect sprays, so be cautious using any type of chemicals, soaps or oils to control pests on succulents. Some of these products can do more damage to the plant than the bugs do! Always test any type of pest control products you use by spraying one leaf, and waiting a few days to make sure there’s no damage before you spray the whole plant. If your succulent plant is tolerant, then I recommend using neem oil to fight houseplant pests, which is a natural pesticide and it works great for getting rid of houseplant pests. Organic insecticidal soap is also great for killing succulent plant pests, or you can make your own using a mixture of 1 tsp mild liquid soap per 1 liter of water. Hot pepper wax repellent or horticultural oil also work to help control bugs on succulents. You can also spot-treat succulent plants by dipping a cotton swab into rubbing alcohol and using it to kill and remove the bugs. Succulents are very easy to propagate. Many can be propagated by leaf or stem cuttings, and several other types can be propagated by division. The key to successfully growing succulents from cuttings is to keep the soil on the dry side, but the air around the cutting humid. Succulent cuttings can rot easily, so be sure to use a coarse sand or poultry grit, and perlite or pumice mixture to root the cuttings. To increase your changes of success, dip the cutting in rooting hormone before sticking it in dirt. Rooting hormone helps the cuttings grow roots faster. 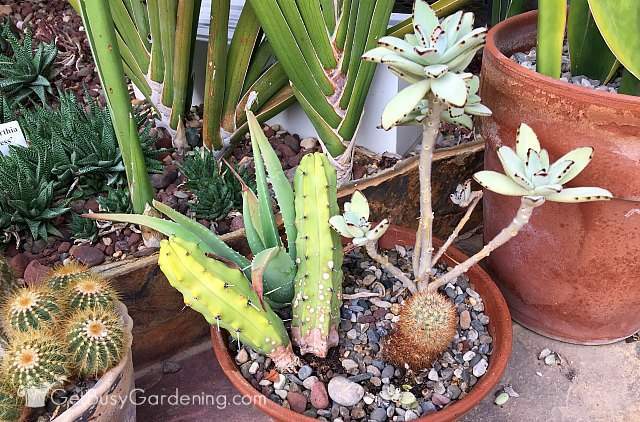 But, if you already have leggy succulents, you can prune or pinch them to help them keep their compact shape. Prune off weak and leggy growth by pinching it off with your fingers, or snipping it off with a sharp pair of pruners. There are lots types of good indoor succulents that can be grown as houseplants. I won’t attempt to list them all here, but these are my top picks for some of the best succulents to grow indoors (and some of my personal favorites!). Many types of succulent plants will flower on a regular basis when they’re grown outdoors in their native habitat. But succulents that flower indoors are an extra special treat, especially when they’re winter blooming plants! A few of the succulents I listed above will flower outdoors, but it’s pretty rare for them to bloom when they’re grown as houseplants. 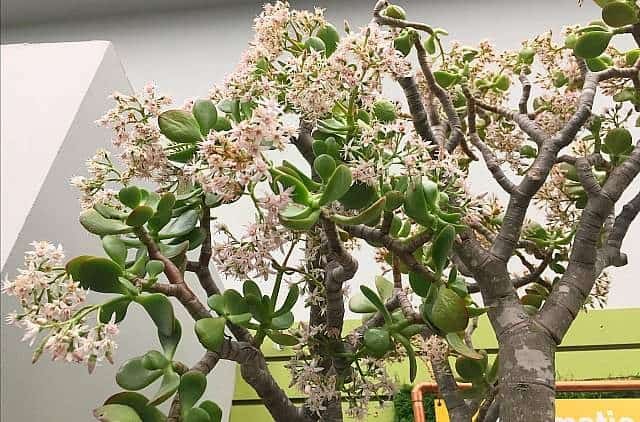 Here is a list of some common succulent plants that bloom indoors on a regular basis, and all of these are also super easy to grow indoor plants. If you’re looking to buy succulents to add to your collection, you can find succulents for sale online or at your local garden center. If you love to grow houseplants, but don’t love the maintenance of growing tropical plants indoors, try growing succulents inside! They’re fun to collect and can even be a little addictive (not that I would know anything about that). 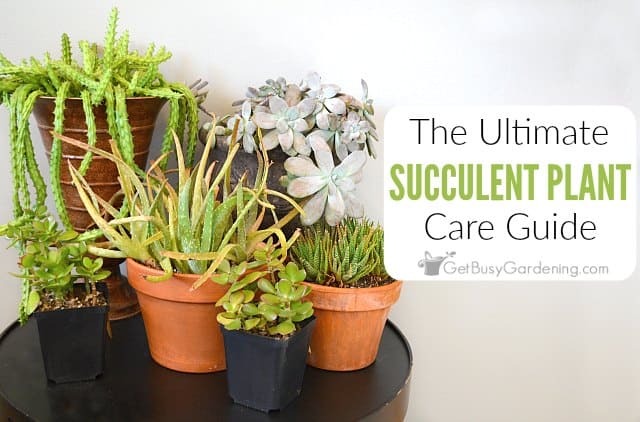 And if you follow these succulent plant care instructions, you can’t go wrong! If you struggle with succulent care in winter, or to maintain any healthy houseplants during the long, dark winter months then my Winter Houseplant Care eBook is for you! This eBook will show you exactly how to keep your indoor plants alive through the winter, and thriving all year long! Pick up your copy today! Do you grow succulents as houseplants? Leave a comment below and share your indoor succulent plant care tips. Haha, that’s very true! Sorry to hear about your poor jade plants. My cats don’t bother mine at all, luckily. Wow. I LOVE your succulent dish gardens. You inspire me. Maybe I'll give them a go sometimes. @Grace – Thanks! I'm happy that I've inspired you! I too love succulents, and have also killed my fair share. But they are just so beautiful I can’t stay away. I have a question for you, I hope you can help me out. Do you have a good method for moving/replanting a donkey tail succulent plant without it breaking apart? The little nubbins, they’re so fragile, but I really need to get it in another hanging pot. I am trying to id my succulent plant. It looks exactly like the drooping green plant in the second image posted on this page. Can you tell me what it is so I can know how to treat it? I have always loved succulents, so I have decided to start growing them. Your article has been very helpful. I saw a few succulents that are so beautiful I would love to grow them. They are called blue African succulent and blue stone flower. Do you know much about these. Are they easy to grow. Thanks for all your great tips. Great, so glad you found the post helpful! I’ve never heard of either of those plants, but I looked them up. It looks like the blue African succulent is a type of aeonium. 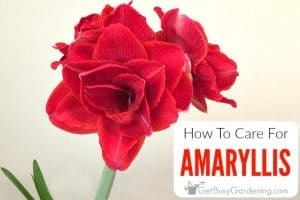 While I’ve never grown that specific variety, I have grown lots of aeoniums and they require the same type of care as I’ve outlined in this succulent care guide. I couldn’t find anything conclusive when I searched for the blue stone flower, so I’m not sure what that one is. Most succulents and cactus plants have very shallow roots and can grow in the pot for many years. You’ll know it’s time to repot them if you see roots growing out of the bottom of the pot, or at the top of the soil. That means they’re pot-bound and need to be moved into a larger pot.